Commentary written by Simon Witter, spoken by Stuart St. Paul. Interview with Ringo Starr and Barbara Bach, then 'Tie Your Mother Down' from 1986, with clips from over the years. Interview with John and footage of Queen in Japan (with album version of 'Seven Seas Of Rhye'), and interview with Kaz (Japanese coordinator). Excerpt of 'The Fairy Feller's Masterstroke', with footage of Queen press conference and in and around Japan. Further interview with John and more footage of around Japan, with excerpt of 'Someday One Day'. Footage of 'Now I'm Here' (Japan, 1975), interview with John, and footage of 'In The Lap Of The Gods.... Revisited' (Japan, 1975). 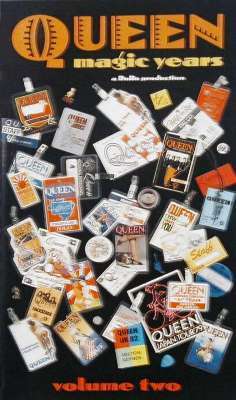 Archived comments of Queen from Japan, and interview with Roger from 1984/5. Footage of 'Keep Yourself Alive' (Hyde Park, September 1976), and interview with Richard Branson. Footage of Freddie's 'Vocal Improvisation' and 'Flick Of The Wrist' (Hyde Park, 1976). Interview with John Harris (sound mixer), footage of 'Killer Queen' (Earl's Court, 1977), and interview with Gary Numan. Excerpt of 'Body Language' and mud-wrestling footage, and interviews with John 'Tunbridge' Wells and Wally Gore. Clip of 'Las Palabras De Amor' (Top Of The Pops, 1982), and interviews with John Entwistle, a young Queen fan, Roy Thomas Baker. Interview with Brian and his father Harold about making his guitar. Footage of Roger's Drum Solo (unknown concert), intercut with footage of Brazil, and footage of Queen on Brazilian TV, March 1981. Footage of 'Somebody To Love' (Sao Paulo, 1981) and interview with Jim Beach about security. Footage of 'Love Of My Life' (Buenos Aires, 1981) and interview with Freddie from 1985.